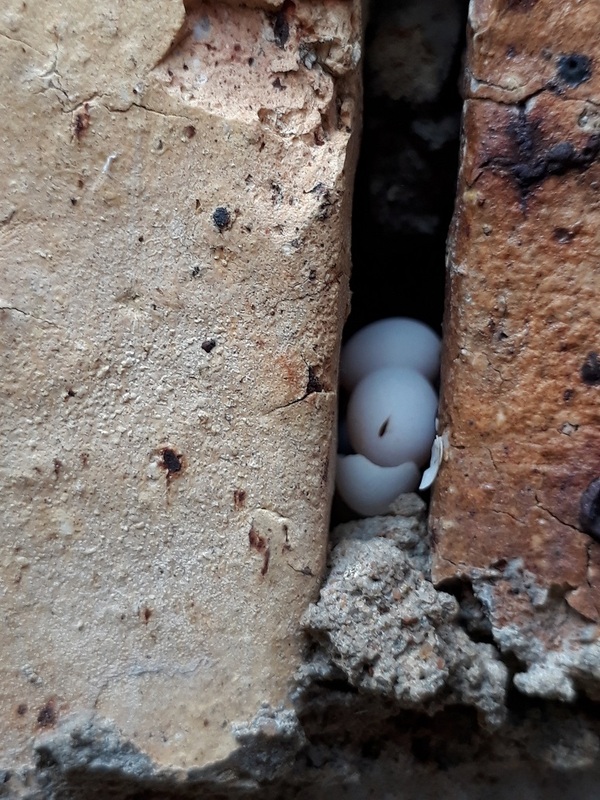 Wedged into a crack between the bricks, tucked away, half hidden in the shadows – until the sun moves along its arc to highlight a little miracle: lizard eggs. 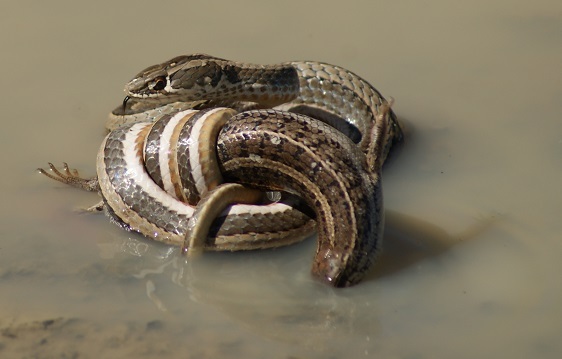 A quite unexpected find along a dirt road far from the nearest water source: a Pelomedusa subrufa. 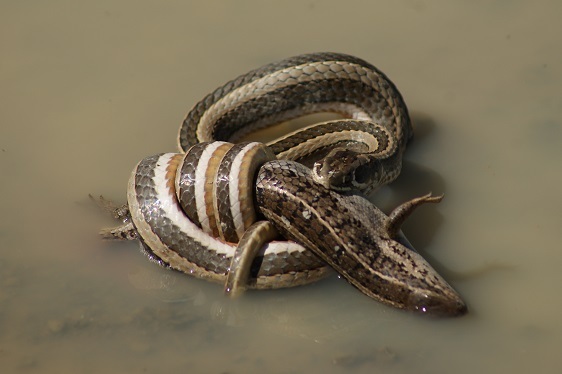 I am not being highfalutin here, but sticking to the name that is common to the variation of common names I have come across, such as: Helmeted Turtle, Marsh Terrapin, Side-necked Terrapin, and Waterskilpad. We nearly didn’t see it as it blended so well with the gravel on the road and the shadows as it sought shelter under a bush. Seven hours later another one crossed a different road in front of us. 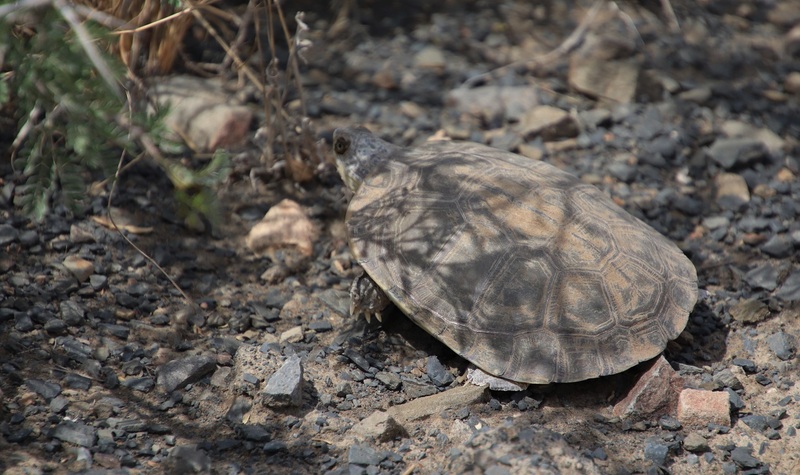 According to the reference below, although these freshwater turtles/terrapins live in water they make terrestrial excursions during the rainy season. The rainy season? 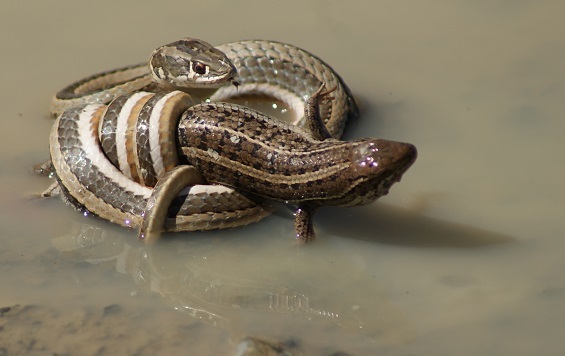 Perhaps these two were out and about because this particular area of the Karoo had experienced a heavy downfall of rain the day before our arrival. 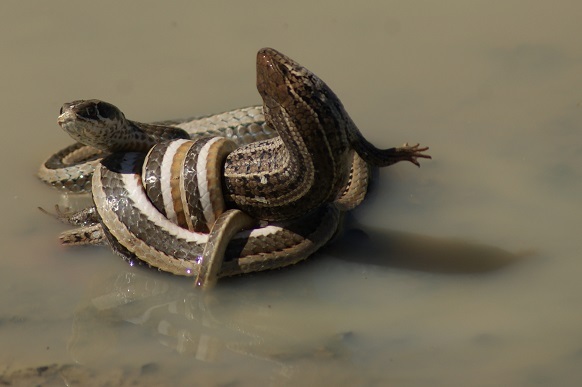 There were still a few muddy puddles here and there in the veld – none that would remain for more than a day or two. 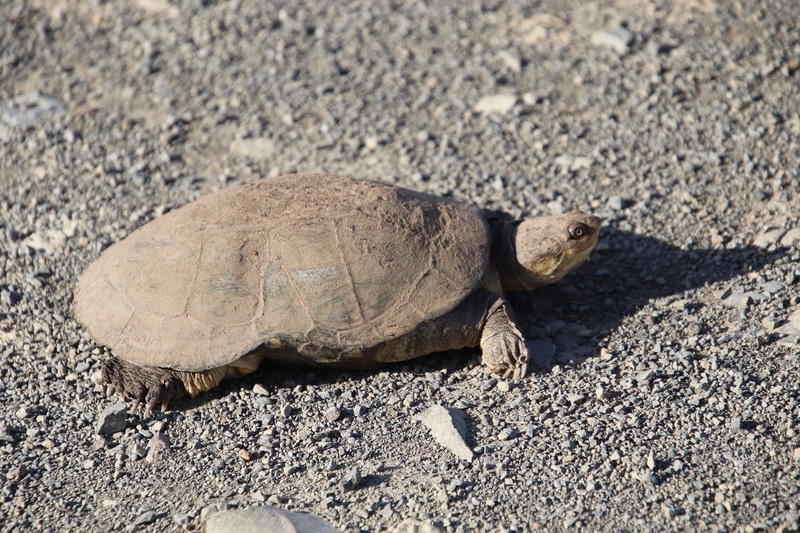 What is particular noticeable about this terrapin is that its flattened shell is oval to circular and that the head and neck withdraw side-ways into the shell. The carapace and plastron are brown to black in colour – both of these terrapins are also covered in dust and what could be the remains of mud. They are occur through most of South Africa except in the western regions. Jack’s picnic site in the heart of the Addo Elephant National Park is a good place to stop for lunch and enjoy a break from driving. Each picnic site is separated from the next by a thick hedge of Spekboom and other indigenous plants, so one does not have to wait long to get close-up views of a variety of shrub-loving birds. 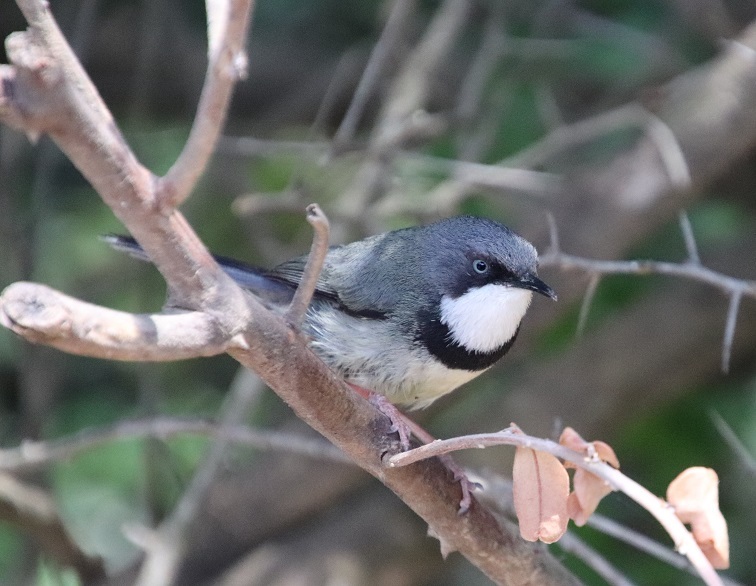 We were able to admire a Bar-throated Apalis – a bird heard all over the park, but which is not easily seen whilst one is driving. 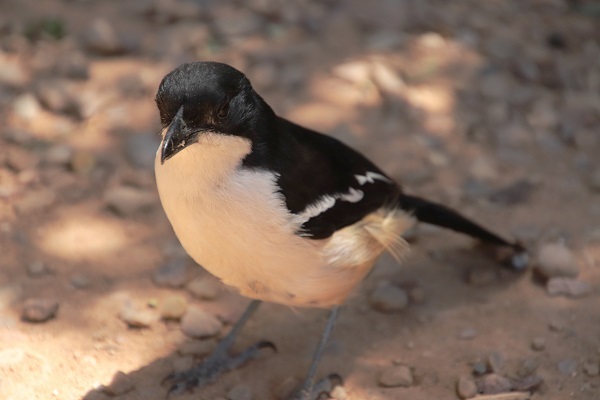 It wasn’t long before a Southern Boubou made an appearance. 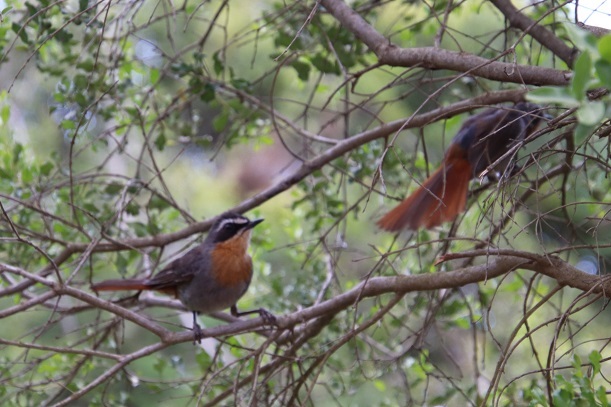 A pair of Cape Robin-chats came to investigate the pickings. We are always pleased to see a Sombre Greenbul (I still think of it is a Bulbul! ), which is another bird more easily heard than seen when one drives through the park. These birds have become accustomed to the regular arrival and departure of humans, for they appeared in quick succession to comb the gravel for anything edible the previous party might have left in their wake. Within minutes of our arrival they had retreated to the dense cover of the surrounding shrubbery as we settled down to enjoy our food and conversation. 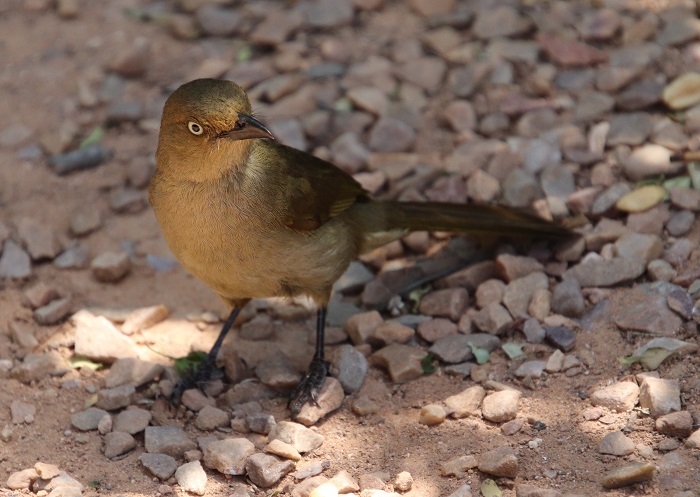 Shortly afterwards I became aware of the Cape Robin-chats calling loudly behind me – I recognised the alarm call from the many times I have heard it in our garden. One of the pair spread its tail feathers out widely, while the other ruffled its feathers as if to increase its size. 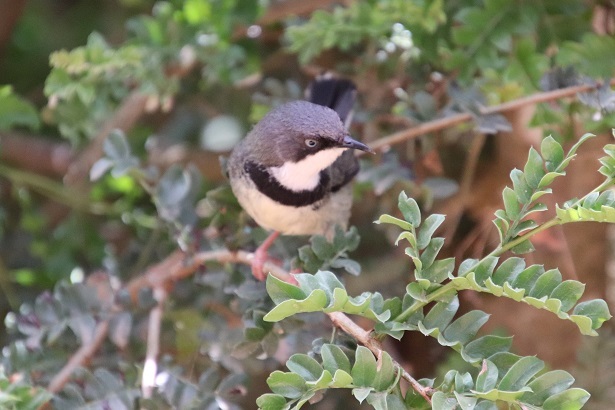 The Southern Boubou emerged from the undergrowth, making a harsh grating alarm call, while the Bar-throated Apalis danced frantically along the top of the Spekboom hedge, snapping its bill and wings – it too was clearly agitated. Something untoward was happening. I looked up in time to see a Boomslang launching itself from the shrubbery onto the roof shading our picnic table – far too fast for me to focus my camera! 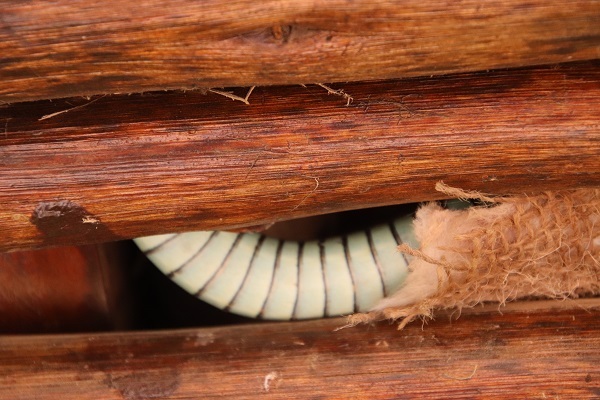 We could see no sign of it on the roof, so we continued our picnic until I looked up again and saw its sinuous length squeezed into the space between the roof and the wooden slats below it. We decided then than it was time to pack up and continue our game viewing drive. 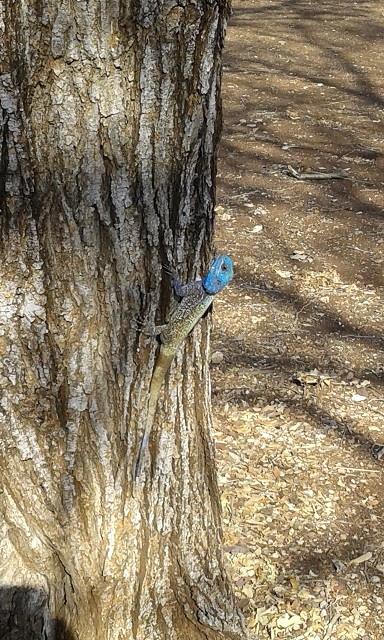 Well, that is what I grew up calling the Blue Headed Lizard or Southern Rock Agama (Agama atra). 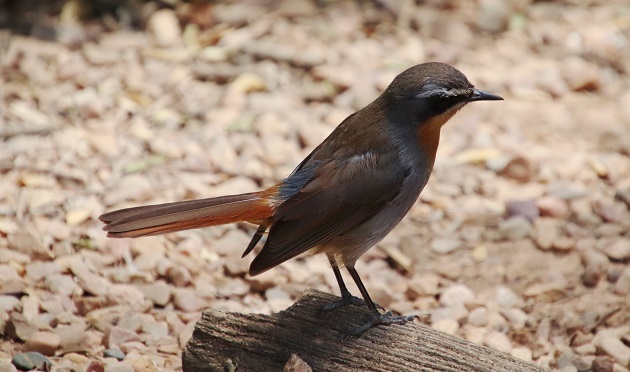 Actually, we simply called it a ‘bloukop’ whenever we saw one in the Lowveld where I grew up. 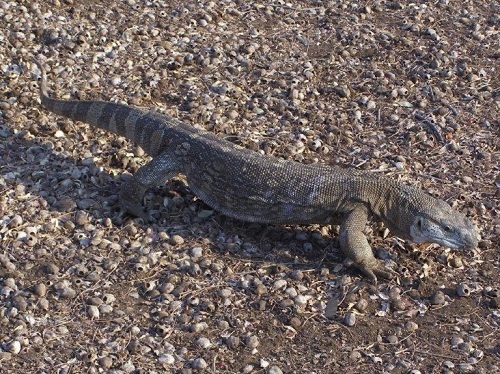 As exotic as they look, they were simply part of our environment as far as we were concerned: nothing out of the ordinary. I feel very different about them since moving away from that part of the country, for I have not seen any in the Eastern Cape. 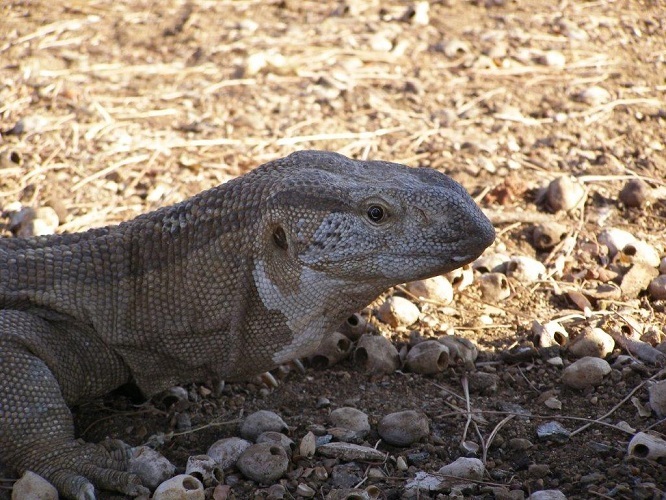 Only the males sport a bright blue head; the head of the female is smaller and paler in colour. 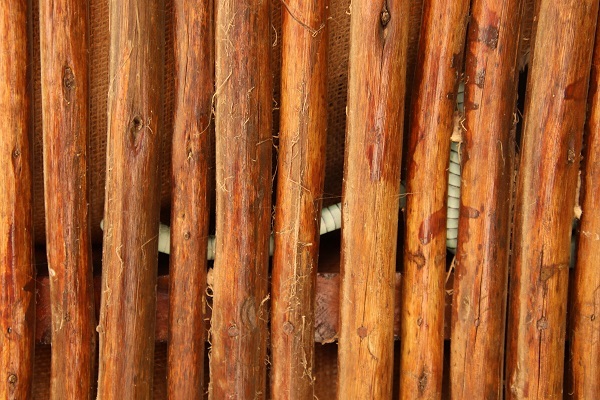 This photograph was taken at Satara Camp in the Kruger National Park some time ago. 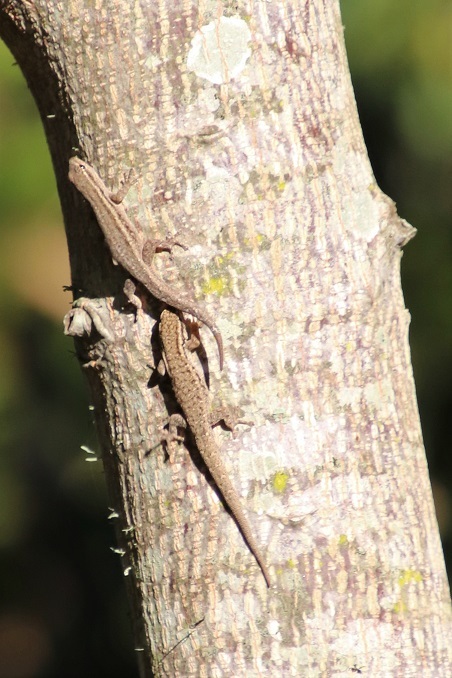 Time marched on, so we did not witness the final demise of the lizard – or did it get away? It was definitely not going down without resistance! 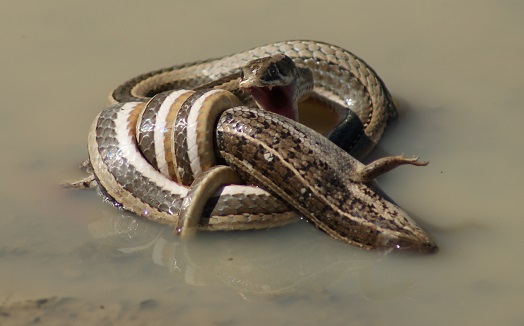 UPDATE: Thank you to Chad Keates (see comment below) for identifying this as a Cross-marked Whip Snake (Psammophis crucifer) eating a Cape Skink (Trachylepis capensis). There is a game for four players printed on the reverse of the map of the Mountain Zebra National Park. 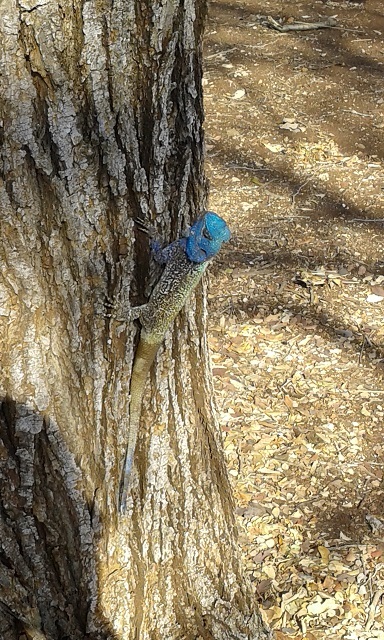 Photographs of the animals, a few prominent birds, and a Rock Monitor Lizard have been allocated various points – adding to the fun of totalling one’s views at the end of the game drive to see who spotted the most animals first along the way. It is a great way of keeping younger members of the family interested for longer than they might else be. She must have had a good view of it from her window; I had to twist around and then try to focus with my telephoto lens in a hurry – not very successful with the grass in the way! In two ticks it had slipped into the water from where it kept a beady eye on a pair of Red-knobbed Coots swimming nearby. 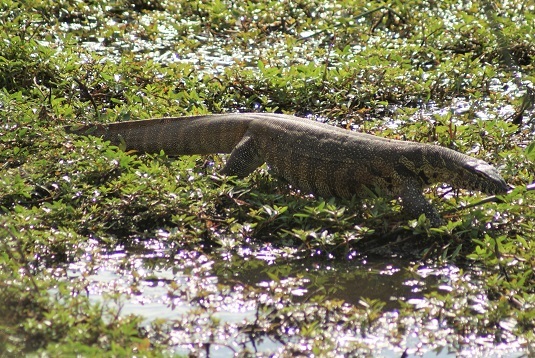 They must have been aware of its presence too as they immediately swam out a little further from the grassy bank.